Hillsboro Aluminum Truck Beds are the ideal combination of lightweight versatility, heavy duty construction and flexible installation. 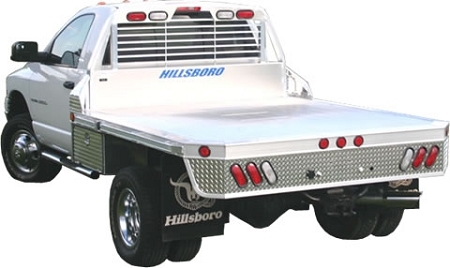 Hillsboro aluminum truck beds for dual and single- wheel trucks adjust to a variety of different height and width requirements, providing a perfect fit regardless of the vehicle. Full vision headache racks adjust to different cab heights and provide complete cab protection, unobstructed rear views and minimum wind resistance. A high-strength alloy floor and heavy-duty aluminum rubrail are designed for lasting durability.